Author(s) Tanenbaum, Andrew, S.; Wetherall, David, J. Appropriate for Computer Networking or Introduction to Networking courses at both the undergraduate and graduate level in Computer Science, Electrical Engineering, CIS, MIS, and Business Departments. Tanenbaum takes a structured approach to explaining how networks work from the inside out. He starts with an explanation of the physical layer of networking, computer hardware and transmission systems; then works his way up to network applications. Tanenbaum's in-depth application coverage includes email; the domain name system; the World Wide Web (both client- and server-side); and multimedia (including voice over IP, Internet radio video on demand, video conferencing, and streaming media. Each chapter follows a consistent approach. 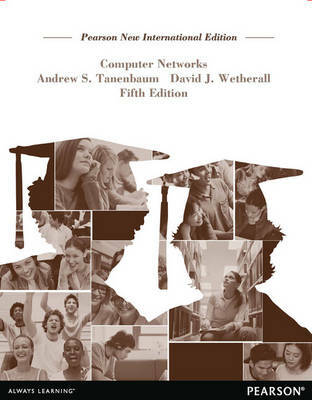 Tanenbaum presents key principles, then illustrates them utilising real-world example networks that run through the entire book—the Internet, and wireless networks, including Wireless LANs, broadband wireless and Bluetooth. The Fifth Edition includes a chapter devoted exclusively to network security.